I really love the energy that I feel at the beginning of a brand new Market. It’s often the culmination of month’s of art and design work presented by the Showrooms to the Trade. Gratifying, when our Design Partners honor my artistic vision and even more so when they enhance the product lines further through their expert manufacturing. Fall Market wraps up and it was a pleasure to have products in two Showrooms this season. Surya, best known for manufacturing my Natural Affinity rug and pillow lines, added Bedding to the mix. My signature Pebble pattern made its debut on the bed in their beautiful showroom. 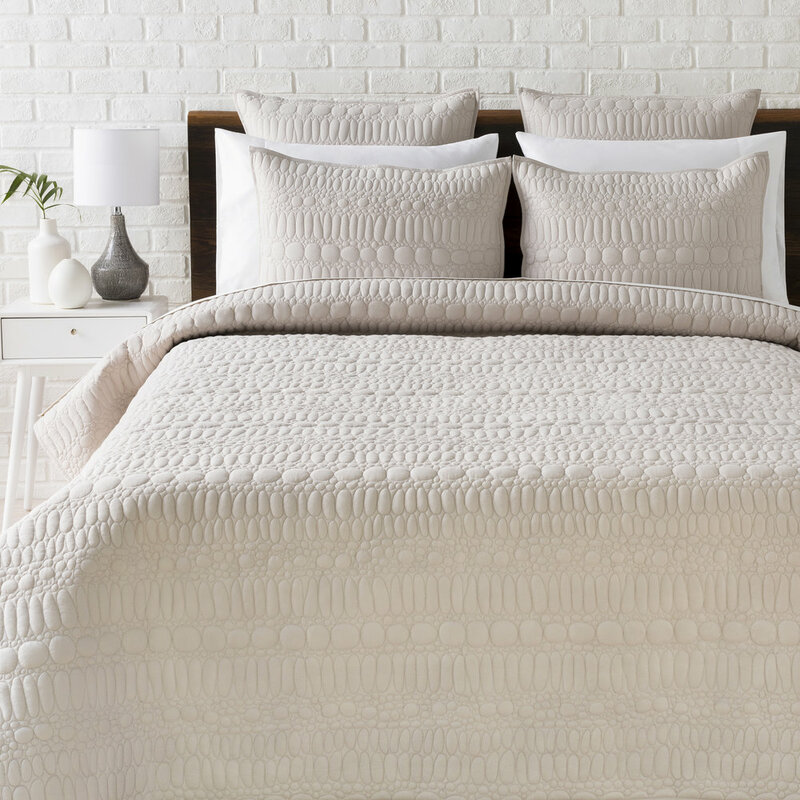 This modern organic, textural layering quilt is available in two neutral color ways and can be purchased via online retailers (including me). 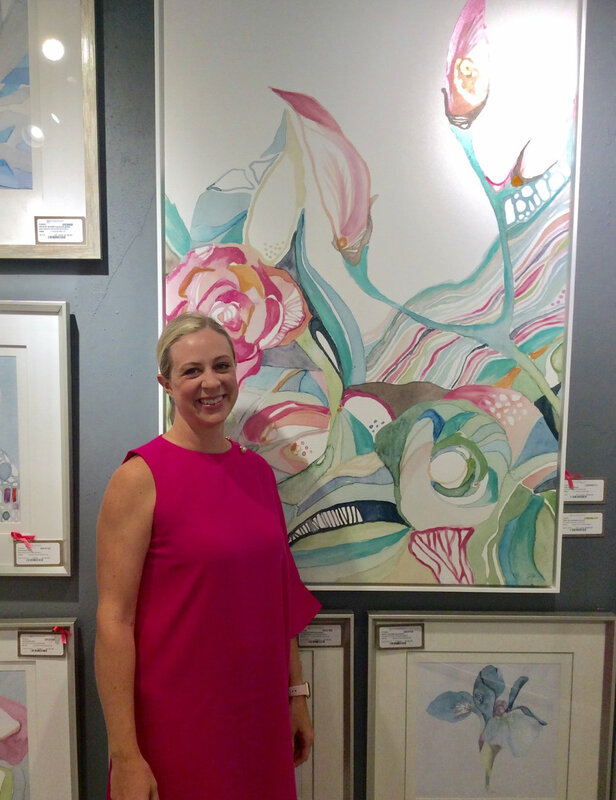 The Picture Source Somerset Showroom launched my second wall art collection to the Trade, over 50 artworks from my portfolio! I was beyond thrilled with the showroom presence… they really honored my work. Let me know what you think! If you are interested in any of the work you are seeing above, reach out! I’d love to hear from you. It's always exciting when I sign with a brand new Licensee, but even more so when they seem just as thrilled about collaborating with me! Very proud to share that my newest collaborative design partnership is with Picture Source Somerset. They will be unveiling approximately 35 new works of art from my portfolio of watercolor and alcohol ink in their High Point Market Showroom this April. The new wall art collection includes works on paper under glass as well as giclee prints on canvas. Read the press release to the trade, which was featured in Home Accents Today. I occasionally come upon some really beautiful quilts that feature my fabrics. I am always in awe... such talent in the quilting community and I consider them among my most enthusiastic fans! So, here's a beauty that caught my eye! Featured over on the MagnoliaQuilts Etsy shop... a gorgeous handmade quilt that utilizes quilting fabric from Soft Repose, my first collection with Freespirit fabrics/ Coats. This collection lends itself to more contemporary quilt concepts and this one showcases that to spectacular effect! But when the walls are up, the carpet unrolled, the lights working and the samples unpacked and styled, it's pretty fantastic:) Months of hard work to fulfill a vision, realized. Just as it was for last year's quilt market when we launched Soft Repose, our booth continued to be a haven of calm and tranquility. A lighter, softer, gentler touch overall... which is in keeping with the design aesthetic of the Shell Rummel brand. We launched Bloom Beautiful, a rose garden inspired collection that features the prettiest design elements, like roses in bloom, song birds, branches and willows, all in my hand painted watercolor style. It's a very relatable collection of patterns that mix beautifully with our Quiet Moments collection from last spring... and yes, that's intentional;) I want my stores to get the most longevity they can out of a collection, so we layer colors and patterns in a way that allows each new collection to build on the one that came before it. Of course, time at a trade show is always measured best by the company you keep. We were fortunate to have spectacular neighbors, Tim Holtz and his lovable team, as well as visits from some fellow designers. Always grateful for the generous spirit of those we share time with. A joy to have Rachel working with me for nearly 10 years and counting! She worked so hard to help bring our booth to life and really, she's the coolest, so I couldn't deny her a design field trip to the Museum of Fine Art Houston to see the Oscar de la Renta exhibition... a highlight of our time in Houston. I am amazed at the kindness of the quilting/sewing community! So many shop owners and fabric lovers from all over the globe came by to admire our booth and the lovely projects we featured. We welcomed the company... they truly are the nicest people you'll ever meet. It's an honor when a store owner/buyer chooses to bring your products into their store and offer it to their customers and we take great pride in knowing that our collections are gaining a following both here and overseas. Bloom Beautiful is in pre order now and ships in May. The collection is available via Freespirit fabrics. In preparation for Quilt Market this coming October, I have been fortunate enough to work with some amazing quilters & sewers who have been creating the most beautiful projects out of my fabric collections. 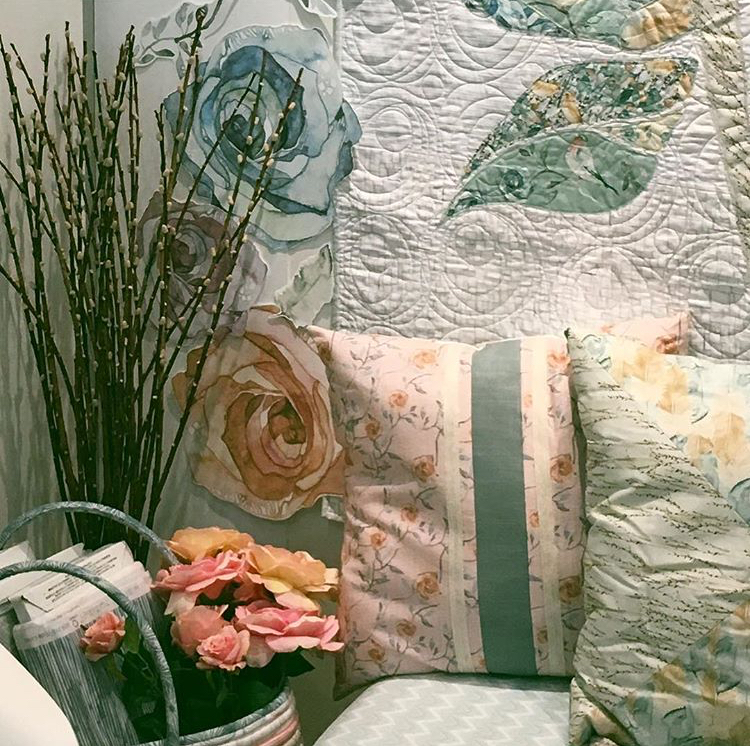 These projects are an integral part of our Quilt Market booth display and really help the Market attendees envision all the ways our fabrics can be used. We aim to inspire! When it comes to choosing a sewer to work with, I'm looking for a partner who is not only skillful at sewing, embroidery and stitching, but who also is interested in creating projects that will enhance my brand's softly sophisticated and natural design aesthetic. We are always on the lookout for sewers who are energized by the idea of working with us to create projects that evoke a more organic, modern vibe. We happen to have enough fabric left from both Bloom Beautiful, my newest collection which launches at Fall Quilt Market, and Quiet Moments, the collection we launched last Spring, to be able to offer up more of it to a handful of additional sewers. However, the turnaround time is tight! I will need completed projects back in hand by the second week in October. If the idea of this appeals to you, if you have mad skills and if you can work on deadline, reach out and pitch me a project idea:) If I like it, I'll get back to you quickly and we'll have a chat to see if it feels like we're a good fit to partner up! If I don't choose you, please don't feel discouraged! I will be happy to add you to our list of sewers...we pull from it often for various projects. You can contact me via my website or over on my Instagram or facebook pages. The Handmade Pop-Up is LIVE! This year, one of my personal goals was to be more active within the different communities of artists that I follow. I tend to be quite comfortable in my cocoon of quiet but I recognize the value that comes with feeling a part of something bigger. There is energy in community, and particularly when it comes to artists, that energy is inspiring. So this spring, I leapt out towards the edge and applied to be a vendor at the Handmade Pop-up, an Online sale which features fine artwork and hand crafted goods (ceramics, jewelry, fiber arts...) from 200+ artists, artisans, designers and creatives all around the globe. I am offering 5 watercolor and Ink paintings; 2 figurative illustrations which have been part of my personal portfolio and are quite special to me, 1 abstract land/sea scape which is unique because it's a little different than my usual palette... and 2 brand new paintings that I created specifically in honor of this event. My pricing is reflective of the spirit of a Pop-Up shop... I really wanted my work to be attainable to those who would like to add it to their private collections. I'm thrilled to be a part of this community and grateful for the support of women entrepreneurs that support and encourage each others creative selves to flourish. Made it up to NYC for Market Week which always yields some lovely showroom photos. Popular Bath had a beautiful display of our collections, front and center in their showroom. Great to see it all together and hear the favorable reviews by the buying teams. Kohl's currently offers the entire collection and additional retailers are coming soon! I was able to preview the next batch of designs which are still in production, but there are some nice, earthy neutrals, soon to be added to the mix. Our studio has also designed some new concepts featuring bolder pops of color, modern coastal elements, eye catching geometrics and of course, our signature tranquil patterning. Sandstone collection offers a full range of bathroom textiles and accessories in a modern marble design. Thanks to Home and Textiles Today for the beautiful Press featuring our new Sandstone Collection!